The fifth Atlantic hurricane and the 13th named storm of the season—Matthew—is now a major Category 3 storm with 115 mph winds and forecasters predict little change in strength during the next 48 hours. For now forecasters expect Hurricane Matthew to continue heading west through the Caribbean, and then turn to the north and northwest on Saturday/Sunday, putting the islands of Jamaica, Hispaniola and Cuba in its path. A hurricane watch may be required for Jamaica later today, according to the NHC. 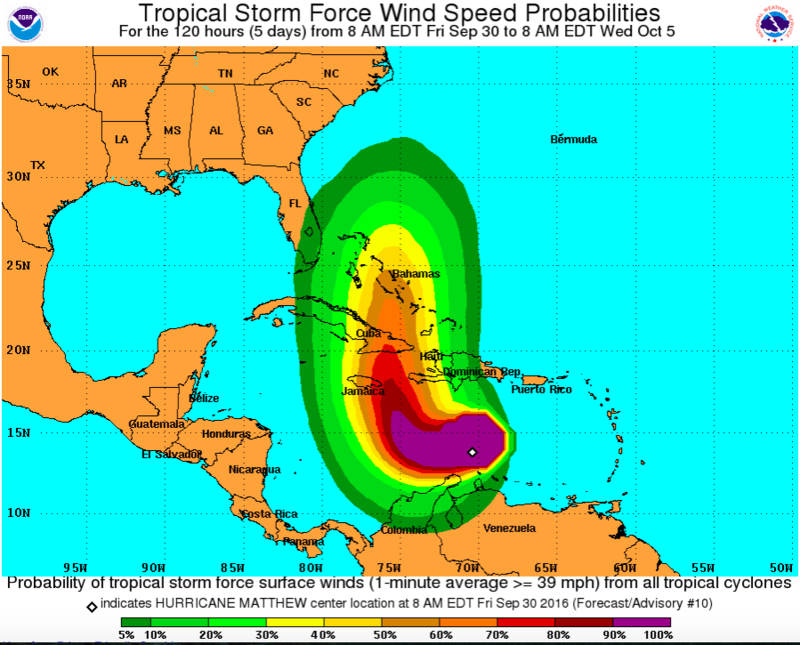 Insurers, reinsurers and others will be monitoring Hurricane Matthew closely over the weekend and into next week. Check out Insurance Information Institute facts and statistics on hurricanes here. Just days after the disclosure of a massive data breach at email provider Yahoo, believed to have been the work of a state-sponsored actor, it’s notable that cybersecurity made news during the first of three U.S. presidential debates last night. In her response, Clinton described cybersecurity, cyber warfare as one of the biggest challenges facing the next president. She said the U.S. faced two different kinds of adversaries: independent hacking groups that try to steal information so they can use it commercially to make money; and cyber attacks coming from states and organs of states. Trump and Clinton then went back-and-forth on whether Russia was responsible for the hacking of Democratic National Committee emails earlier this year. The just-disclosed 2014 Yahoo breach, in which 500 million accounts were compromised, highlights concerns around the number of state-sponsored cyber attacks, according to this article by the Wall Street Journal. While organizations should consider the purchase of cyber insurance to manage the financial consequences of an attack, a 2015 Ponemon study found that a more popular approach to managing the risk of a nation state attack is a government-subsidized insurance policy (see below). Some 17,475 IT and IT security practitioners located in all regions of the U.S. participated in the Ponemon survey. The Insurance Information Institute’s latest white paper on cyber risk threats and challenges is available here. Ongoing civil unrest and protests in Charlotte, North Carolina following the police shooting of Keith Scott are reported to have caused significant property damage to businesses in the central area of the city. The Charlotte Observer reports that entertainment complex EpiCentre faced looting and sustained significant damage Wednesday night. Numerous businesses were damaged, including Sundries EpiCentre, CVS, Enso and Fleming’s Prime Steakhouse, it said. The NASCAR Hall of Fame was among other sites hit by vandals, with adjacent restaurants and hotels also damaged after officials declared a state of emergency for the city. As clean-up gets underway it’s important to note that most commercial insurance policies generally include coverage for losses caused by riots. civil commotions and fires. The definition of rioting covers looting by people who steal merchandise or other property from a premises. Vandalism is also covered. According to The Charlotte Observer, a possible curfew for Thursday night is being discussed by city officials. The Insurance Information Institute (I.I.I.) notes that if a business has to suspend operations or limit hours due to rioting, business interruption coverage is only covered if there is direct physical damage to the premises, forcing a business to suspend operations. In April 2015, looting and arson in Baltimore, Maryland, following the funeral for Freddie Gray, a 25-year-old who died after suffering a severe spinal cord injury while in police custody, resulted in estimated property damage of about $24 million, according to the I.I.I.. Multiple explosions over the weekend in New York and New Jersey as well as a knife attack by an individual at a mall in Minnesota come amid heightened concerns of terrorist attacks 15 years after 9/11. Some 29 people were injured in the blast Saturday night in New York City’s Chelsea neighborhood, which is also reported to have caused significant property damage. Meanwhile, nine were injured in the Minnesota mall attack, where the suspect was killed by police. Monday morning another explosion was reported near Elizabeth train station in New Jersey, where up to 5 devices were found, and as the FBI investigation intensified and security tightened around major transportation hubs, law enforcement officials arrested a suspect in the NY/NJ blasts. While the unfolding events are unsettling, it’s good to know that if the home you own were damaged by an explosion and fire, personal insurance policies have you covered. Standard homeowners insurance policies cover the homeowner for damage to property and personal possessions due to explosion, fire and smoke—the likely causes of damage in a terrorist attack, according to the Insurance Information Institute (I.I.I. ), even if terrorism is not specifically referenced in the insurance policy. Condominium or co-op owner policies also provide coverage for damage to personal possessions resulting from acts of terrorism, while damage to common areas of a building like the roof, basement, elevator, boiler and walkways would be covered providing the condo/co-op board has purchased terrorism coverage. Standard renters insurance policies also include coverage for damage to personal possessions due to a terrorist attack. Again, coverage for the apartment complex itself must be purchased by the property owner or landlord. If your car is damaged or destroyed in an explosion your auto insurance policy will cover the damage if you have purchased “comprehensive” coverage. Commercial insurers are required to offer coverage against terrorist attacks and many owners of commercial property, such as office buildings, factories, shopping malls and apartment buildings, have purchased the coverage. Marsh estimates some 60 percent of U.S. businesses have purchased terrorism insurance, up from 27 percent in 2003. However, losses are only covered by a commercial terrorism insurance policy if the government officially certifies an attack as an act of terrorism. Several criteria must be met for the certification to be made. If property/casualty losses do not exceed $5 million in the aggregate, the act will not be certified as an act of terrorism. Acts of terrorism are excluded from most standard business insurance policies. Workers compensation—a compulsory line of insurance for all businesses—covers employees injured or killed on the job and therefore automatically includes coverage for acts of terrorism. Check out I.I.I. facts and statistics on terrorism. If, like me, you’ve taken a ride to the airport with Uber, or looked into renting a holiday home via Airbnb, did you take a moment to think about your insurance coverage? If the answer to that question is “no,” you’re not alone. A recent public opinion survey from the Insurance Research Council (IRC) found that 56 percent of all adult Americans who said they have participated in the sharing economy indicated that they did not consider their insurance coverage at the time. This is despite the fact that more than half of all respondents said that the sharing economy exposes the general population to increased risk. Survey respondents gave numerous reasons for not participating in the sharing economy. Unfamiliarity was cited most frequently (65 percent), while lack of need was cited by 60 percent and lack of interest by 54 percent. However, a lack of insurance was the least cited reason for not participating. And for insurers, too, we would add. 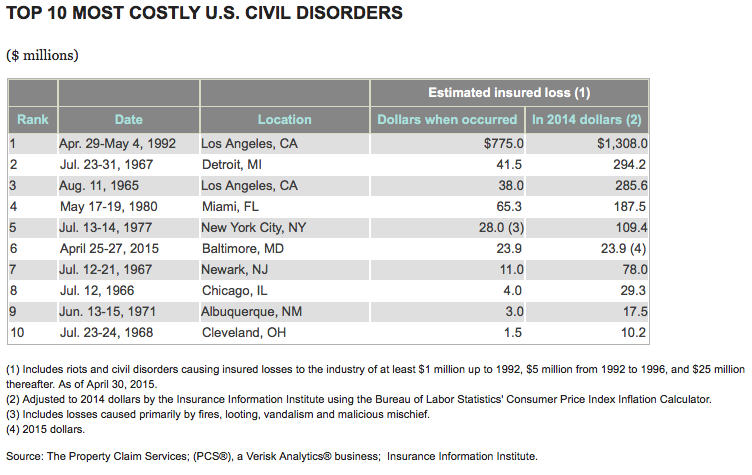 Check out a recent Insurance Information Institute (I.I.I.) presentation on the role of insurance in the sharing economy. Other I.I.I. resources include information on car sharing and peer-to-peer car rental insurance as well as peer-to-peer home rental and homeowners insurance. The IRC report, The Sharing Economy: Public Participation and Views, presents findings from an online survey conducted by GfK Public Affairs & Corporate Communications on behalf of the IRC. A total of 1,105 online interviews were conducted for the study, using a sample drawn from GfK’s Knowledge Panel. Survey data were weighted to the U.S. population of adults aged 18 and above. Today marks the 15-year anniversary of 9/11, the costliest terrorist attack on record in terms of lives lost and property damage. As we honor those who perished and the courage of first responders on that day, here’s an interview with new Insurance Information Institute CEO Sean Kevelighan on NY1 News, discussing the 15-year anniversary of 9/11 and terrorism insurance. Good news for cyber insurers. A majority of companies continue to have network security and data privacy insurance, and are making their purchase decisions faster and experiencing fewer purchasing challenges than in 2015. The findings come in the newly-released 2016 Network Security and Data Privacy Study by Wells Fargo Insurance. While in 2015 the study showed that 22 percent of companies buying insurance took more than 12 months to make the purchase decision, in 2016 just 8 percent of companies are currently taking that long, while 59 percent are taking six months or less. Cost of coverage and finding a policy that meets a company’s needs remain the top two insurance purchasing challenges of 2016. However, the study found that 19 percent of companies did not experience any purchasing challenges, a significant improvement over 2015 when only 6 percent did not experience challenges. The easier purchasing process may be related to less internal resistance, Wells Fargo said. Likewise, in 2016, fewer companies (24 percent) believed the risk was not big enough to warrant the purchase of network security and data privacy insurance. Of the companies in the study that had purchased insurance, one-fifth reported filing a network security and data privacy insurance claim in the last 12 months, and most were satisfied with their coverage. Another key takeaway for cyber insurers? Protecting the business against financial loss was the primary reason for purchasing coverage (81 percent) in 2016, as in 2015. However, protecting the company’s reputation is an increasing concern, with 70 percent citing it in 2016, compared to just 58 percent in 2015. Purchasing insurance is an important step, but it should be used in tandem with developing and testing a comprehensive incident response plan and performing a thorough cyber risk assessment, Wells Fargo noted. The second annual study analyzed trends of network security and data privacy issues among 100 decision makers at companies with $100 million or more in annual revenue. Check out Insurance Information Institute’s (I.I.I.’s) latest white paper on cyber risk threats and challenges here. Research tells us that 40 percent of Americans use their smartphone to look up government services or information, so if you’re charging your mobile devices in preparation for Tropical Storm Hermine you might want to download the Federal Emergency Management Agency’s (FEMA) updated disaster app. The free FEMA app now lets you receive weather alerts from the National Weather Service, so you can get alerts on severe weather happening anywhere in the country even if your phone is not located in the area. This makes it easy to track severe weather—such as a hurricane—that may be threatening you, your family and friends. Other features of the FEMA app that will help you weather the storm include a customizable checklist of emergency supplies, maps of open shelters and disaster recovery centers, and tips on how to survive natural and man-made disasters. Important features of the app for after the storm, include a disaster reporter where you can upload and share photos of damage and recovery efforts to help first responders, as well as easy access to apply for federal disaster assistance. The FEMA app is available for free in the Apple store for Apple devices and Google Play for Android devices. Here at the Insurance Information Institute (I.I.I.) we also recommend you download our award-winning Know Your Plan app which helps you, your family and even your pets prepare to safely get out of harm’s way ahead of the storm. In addition, the I.I.I. Know Your Stuff home inventory app allows you to keep an up-to-date record of your belongings so you’re fully covered in the event of an emergency. Both I.I.I. apps are available for iPhone or Android.